I was born into the chiropractic world. My father, godmother/aunt, uncle are all chiropractors. I love people and I love being healthy! Chiropractic chose me. I feel it is my mission and my passion to help others reach their fullest health potential, naturally! I attended undergrad at the University of Wisconsin-Eau Claire and went on to Northwestern Chiropractic College. While in chiropractic school, I was an active member of the motion palpation club, received my acupuncture certificate, and also went on a mission trip to Solapor India, serving the underserved. My first internship was working with a pediatric chiropractor. She gave me hands on experience treating hundreds of infants, toddlers, children and pregnant women. My final internship was in Edina, MN. At this clinic I was able to work on the Minnesota Vikings and learn many techniques specific for athletes. I have also worked on Olympic athletes, collegiate athletes and also everyday athletes. I thoroughly enjoy working with all types of people and look forward to helping you achieve your health and wellness goals, naturally!! As a doctor of chiropractic, I truly believe that every single person has inside of them the innate potential to be healthy, naturally. True health is dependent on physical (alignment), chemical (nutrition) and mental (thoughts). When I first examine a patient I look for subluxations (misaligned vertebrae) that are putting pressure on the nervous system not allowing the body to work/heal/operate the way it was designed to. I also look for the cause of the subluxation, so after correction begins I can also address the issues that may have created the subluxation in the first place. I have an awesome family! We are all very active. Ryan, my husband, and I have been running together since we met. 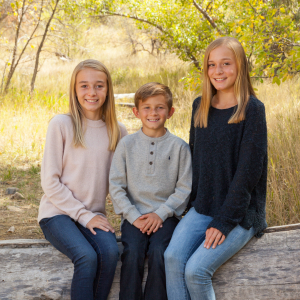 Our children Grace, Lauren & Jamison are very passionate athletic kids! We all competitively run and Nordic ski. Lauren and Jamison also play competitive soccer. We are so blessed to do all of these activities together as a family. Feel your best…Naturally! Contact us to schedule your appointment today.